Come join us for the April Sunday Session! 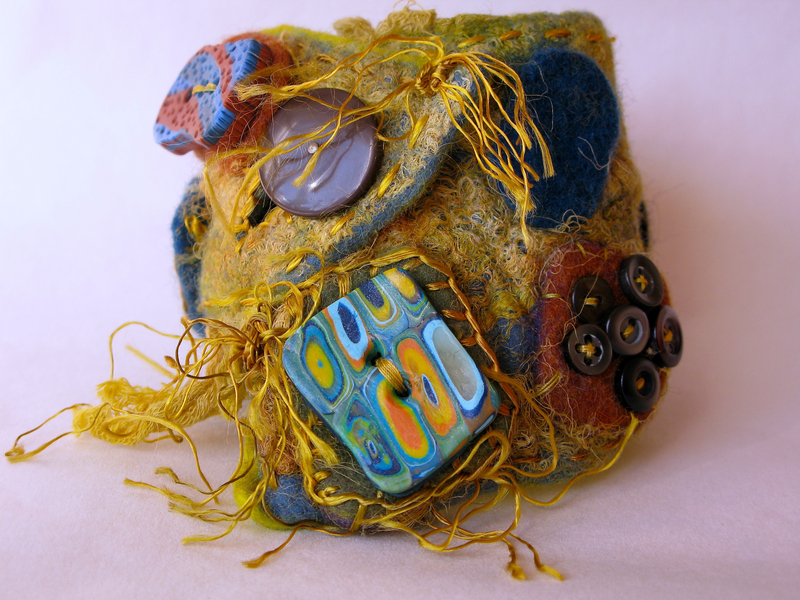 We’ll be talking about embellishing with Polymer Clay. If you’re looking for something to jazz up your felt, this might be one of the ways to do it. – Different types of hollow beads. – Blending and layering clay for different effects. It should be a great day and hopefully the sun will be shining. This will be a demo/discussion day, not a workshop day. The latest edition of our magazine is hitting the presses as I write. One of the many benefits of membership (only €25 annually) is that you get a copy of the magazine posted to you quarterly. If you are unsure if you have renewed and you don’t get a copy of the Magazine in the post in the coming week please get in touch if you would like to stay involved. SPRING 2015 COVER – just click on the link to see the image, Hungarian feltmakers Gabriella Kovac’s beautiful work entitled “Spring” and some very cute felted sheep by Jamie Lewis.